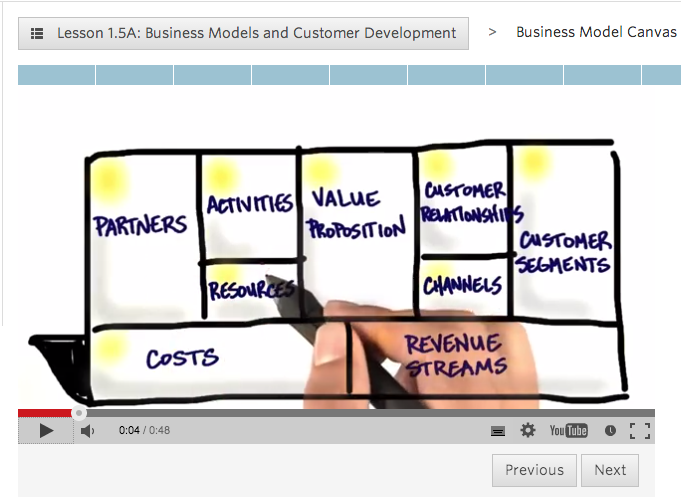 Screenshot from “How to build a startup” (udacity.com) showing one of the key tools, the business model canvas, a visual tool to represent the complete thinking for a startup. That the lean philosophy can be applied much more widely than manufacturing, if done so intelligently, should perhaps come as no surprise to readers of this blog. Recently, I’ve been learning more about one particular re-invention: the lean startup. The ideas have a clear heritage through lean and agile and, of course, place the customer very much in focus. 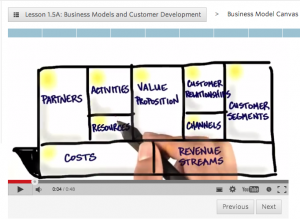 I took the Udacity course How to Build a startup by Steve Blank to get a good overview. There’s plenty in the media on this topic too, with an Economist video special report on Startup 2.0, and even a poignant mention of what can go wrong with the traditional approach to startups on a Listserve email. After some thought of course, it becomes clear that the lean startup is none other than a lightly disguised version of design for six sigma, maybe a little less quantitative and a little more iterative, and good to see it getting wider exposure. The lean startup is, I think, a very logical approach, particularly for web and mobile applications but also applicable to other products, particularly when developing a new market. Maybe the framework can be stretched even wider, to selling any kind of service or idea, all the way through to selling oneself when job-hunting. The key when applying this thinking to new areas, of course, is to begin with the philosophy and develop appropriate tools for the new area rather than mis-translating old ones. This entry was posted in innovation, lean, startup. Bookmark the permalink. Post a comment or leave a trackback: Trackback URL.